All this week, ESPN’s Gamer Blog and SportsNation are teaming up to bring you the Top 5 rated players at key positions in “Madden NFL 12.” And while the list of Top 5 quarterbacks will spark some serious debate from Michael Vick and Big Ben from fans who feel their favorite players have been wrongly left off the list, I’m sure Bears fans will be just as passionate when asking why Brian Urlacher and Lance Briggs fell just short of making the “Madden” cut in the Top 5 Linebackers (especially when there are six players on the list due to a tie for fifth place). Do they have a case? Let the debates begin. When I think about the most dominant wide receivers in the history of “Madden,” one name instantly comes to mind: Rand Moss. 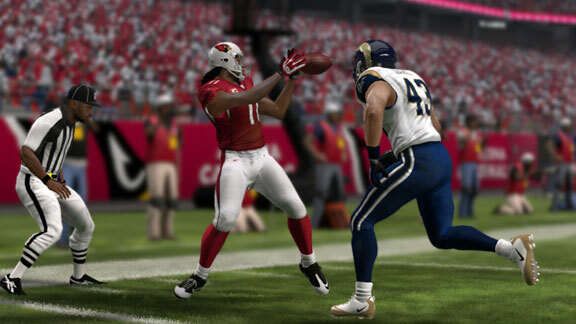 Even last year, EA Sports boosted Moss’ spectacular catch rating to a perfect 100 after “The Freak’s” one-handed grab over Darrelle Revis stole headlines (and highlight reels) across the country. But with Moss retiring, this really is an end to one of the greatest careers in video game sports. That’s because wherever Mr. Jet Pack went, “Madden” gamers followed, as he made any virtual team an instant contender with his speed, jumping ability, and Spider-Man-like sticky hands. So who will step up now that “The Freak” is out? 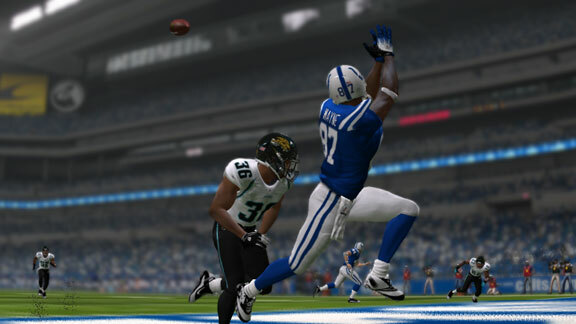 Andre Johnson is the top-rated wide receiver in "Madden NFL 12." 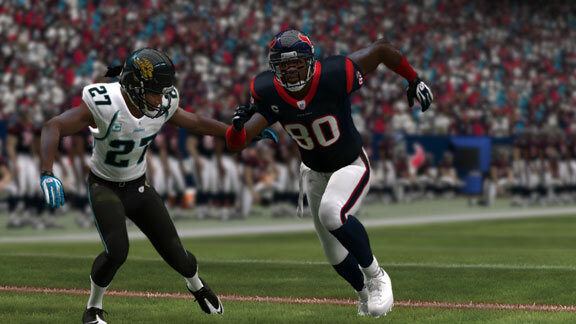 The Texans have a ton of firepower in “Madden 12,” and Andre Johnson’s ability to beat corners down the field and out-jump them for the ball is a big reason why gamers will be flocking to this team online. Johnson boasts 94 speed, 94 acceleration, 93 agility, 96 catching, 93 jumping, 99 stamina, 98 toughness, 95 route running, 90 spectacular catch, and 95 catch in traffic. Then once he catches the ball, watch out because Johnson also runs corners over with 84 trucking. Larry Fitzgerald is ready to put up some big numbers again now that he has an actual quarterback throwing him the ball. His 87 speed, 89 acceleration are a bit slow for an elite receiver in “Madden,” but he makes up for it with 98 catching, 99 jumping, 99 stamina, 97 toughness, 98 route running, 98 spectacular catch, and 95 catch in traffic. 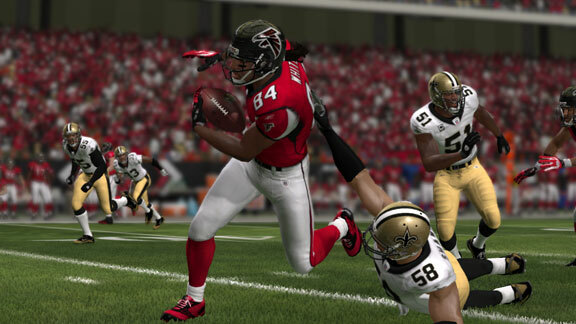 When Roddy White gets into the open field, watch out, because his ability to make defenders miss in “Madden” is staggering. Combine 92 speed and 94 acceleration with 95 agility, 92 elusiveness, 87 spin, and 92 juke, and you have a recipe for broken ankles in the secondary. A smart, sure-handed receiver, Reggie Wayne checks in with 99 route running, 98 awareness, and 98 catching. But the greatness doesn’t stop there for Peyton Manning’s favorite target as Wayne also has 97 spectacular catch and 95 catch in traffic. Basically, throw it to Reggie whether he’s open or not and most likely he’s going to come down with the ball. 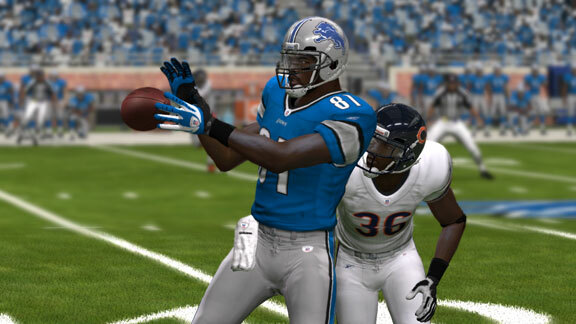 If there’s a young player out there who gamers can look to in order to replace Randy Moss as that freakish receiver in “Madden,” it’s Calvin Johnson. The kid’s numbers are just sick: 95 speed, 94 acceleration, 96 agility, 99 jumping, 97 spectacular catch, 89 catch in traffic, 86 route running, 87 spin, 90 juke. Man, the Lions are going to be fun to play as this year. 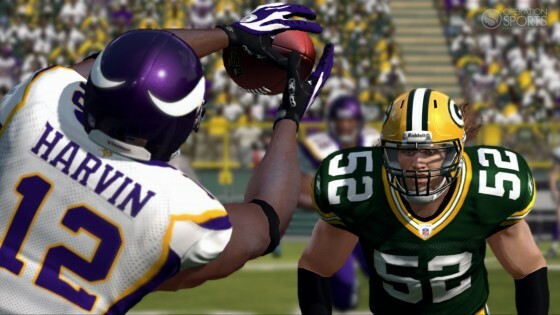 Greg Jennings gives Aaron Rodgers the opportunity to show off that long ball thanks to the blazing fast receiver’s 94 speed and 95 acceleration. But Jennings is more than a track star as the Packer deep threat also possesses eye-popping numbers like 95 spectacular catch, 88 catch in traffic, and 93 route running. Throw in 87 spin and 91 juke, and you have a player who will just as likely make you miss as run right by you. 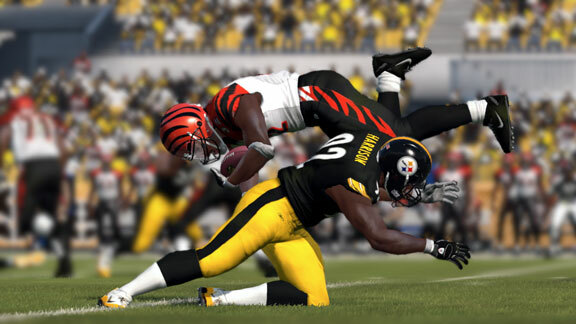 James Harrison is looking to bring the pain in "Madden NFL 12." James Harrison is here to hurt you. That’s all you need to know about his “Madden” character as the Steelers bad boy boasts 97 toughness, 95 hit power, 98 power moves, 99 awareness, 97 block shedding, and 95 player pursuit. Add to the fact that the game features concussions that will knock players out of the lineup, and playing as Harrison is like a virtual fine waiting to happen. 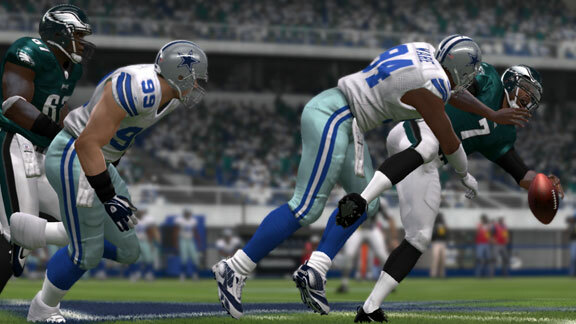 DeMarcus Ware has been an elite "Madden" character for years. DeMarcus Ware has been one of the most popular (if not the single most popular) defensive player in “Madden” for the past few years. The reason? Ware not only has the size and strength to make his presence felt, but in tournament play, he has the ability to sack quarterbacks like no other. “Madden 12” is no different as Ware checks in with 86 speed, 97 acceleration, 90 strength, 88 agility, 99 power moves, 97 finesse moves, 99 pursuit, and 88 hit power. 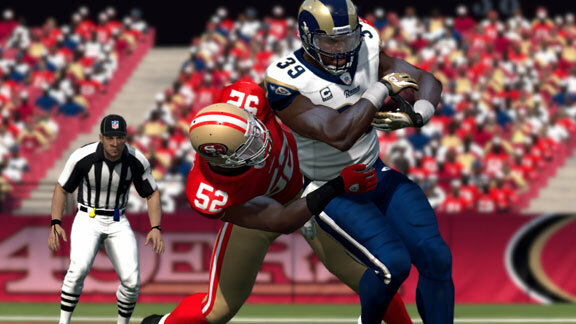 Patrick Willis just wants to hit you as hard as possible. Patrick Willis knows what it’s like to obliterate opponents on the field for real, and when he plays “Madden,” he likes his video game football just as violent. “I’m not the type of guy just to push square and go for a regular tackle,” Willis told me last year during an interview. “I always like to be on top coming down with that Hit Stick and see what happens.” Pain, that’s what happens, especially when Willis is running at you with 90 speed, 96 acceleration, 98 tackle, 99 stamina, 94 toughness, 98 pursuit, and 94 hit power. Jon Beason is one of the best tacklers in the game. With 97 tackle, 99 pursuit, 99 play recognition, and 92 hit power, Jon Beason is about as close to an automatic tackle as there is in the game. 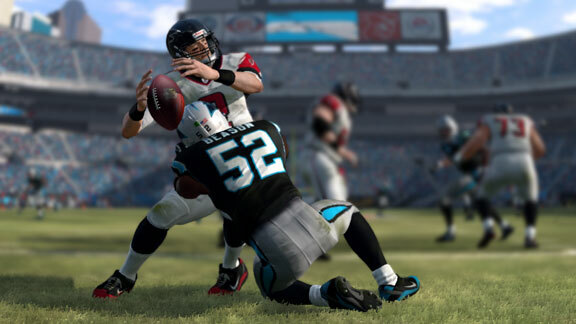 But with only 75 strength, is “Madden” suggesting Beason spend more time in the gym? 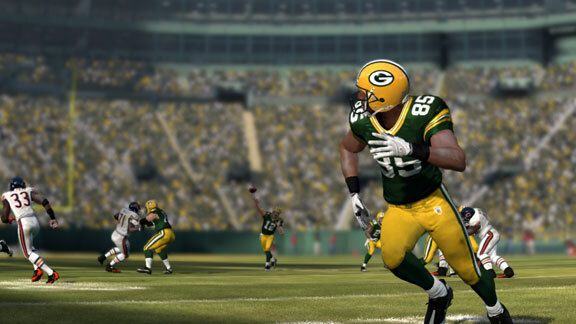 Clay Matthews and his 98 power moves are ready to make a play. 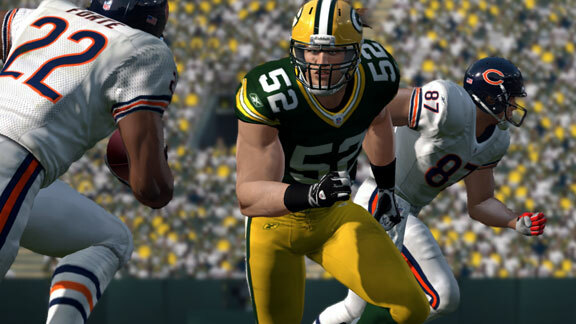 Clay Matthews is a beast for the Packers in the game, dominating the virtual field with scores of 86 speed, 94 acceleration, 98 power moves, 97 pursuit, and 88 hit power. If only he could get a 99 for hair. Even after all these years, Ray Lewis can still Hit Stick with the best of them. 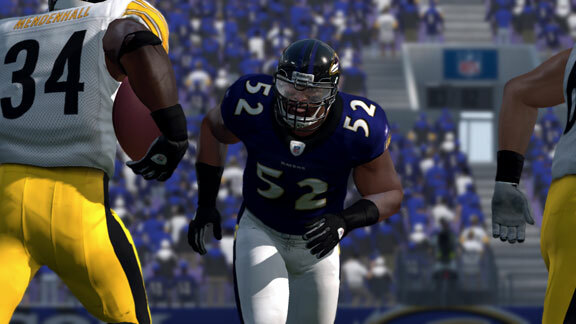 When Ray Lewis was on the cover of “Madden NFL 2005” (arguably the best “Madden” to date), he helped forever change the game for the better as producers introduced the Hit Stick in honor of Lewis. Seven games later and Lewis is still one of the top dogs thanks to 99 toughness, 97 player pursuit, 99 play recognition, and 98 hit power. Who would’ve thought, all these years later and Lewis is still king of the Hit Stick.